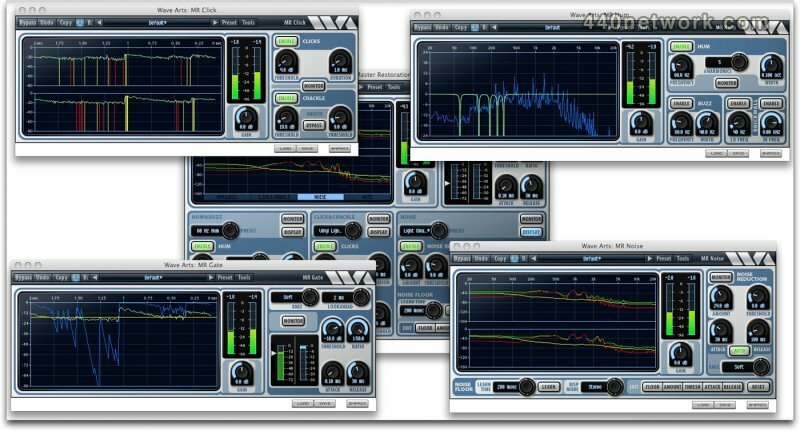 Wave Arts has released the Master Restoration Suite, a suite of plug-ins dedicated to the audio restoration and cleaning. The editor has made a name for himself with its precedent plug-ins, like MasterVerb or TrackPlug, kind of swiss army knives in their respective fields, whose sonic quality is only equalled by their very low CPU consumption. Or the MultiDynamics, which is becoming a secret weapon in movie sound design domain. As he usually does, Dr. Bill Gardner has developed his own restoration algorithms, in order to offer an alternative to the algorithms made by specialized editors (Algorithmix, etc.). Let's see if the qualities you can find in other Wave Arts plug-ins (ease of use, very low CPU drain, pro-audio quality) are included in this new bundle. The Suite is available for Windows (2000/XP and later) and MacOS X (from 10.4, UB) in AU, RTAS, VST, MAS and DX formats, and can be downloaded from the editor web site. The "Suite" term implies several plug-ins, in that case, five: MR Click, MR Gate, MR Hum, MR Noise and Master Restoration which gathers the first four. Master Restoration is only available as part of the Master Restoration Suite, while you can buy the other separately. The graphic interface is a direct descendant of the editor's precedent plug-ins: legible, free from symbols or esoteric typographies and clearly displaying each of the sections and sub-sections dedicated to the various processes. Only the Master Restoration is denser, which is normal. With the exception of the latter, the plug-ins share the same functional architecture: on the left, a large monitor display, on the right, all the settings. MR Noise is the only one to have an extra toolbar on its lower length. This plug-in gathers two modules, the first dedicated to the clicks, the other to the crackles. Another module, Onsets, allows to preserve the transients integrity when processing the crackles. In that case, clicking on Bypass means that you activate the protection... A vumeter and a Gain allow you to precisely define the output level, which could be useful with some files, when there's a click reaching 0dB, for example, meaning that the average level of useful signal is quite low. When clicks are gone, so you can increase the output level. Each module has its bypass (Enable button) and a Threshold. Clicks also offers a Duration parameter in ms, which corresponds to the length of the interpolation used to overwrite the click. Note that proceeding with successive passes generally gives better results than trying to remove everything in one go (and first clicks, then crackles). The display is perfect to monitor your settings, with different colored lines: green for signal, red for clicks, yellow for crackles and grey for transients. The setting of the Onsets Threshold will mainly be done while looking its effect on the monitor. In order to give elements of comparison, we've used the same audio examples as in iZotope RX review (including two excerpts of "Lungs", from Timeless the first record John Abercombrie has released for ECM in 1974). More complex, this excerpt has a lot of clicks and pops blended with the open hihat. On the latter, MR is a bit less efficient than RX, but more than TC suite, for example. If most of the clicks have disappeared, there's still some crackle events at the end, despite several passes. While it immediately comes to mind when you think about noise reduction, the Noise Gate is rarely included in restoration suites. So let's praise Wave Arts for its choice to add a gate/expander. You'll find again the display, the Gain parameter and the vumeter for output signal. Settingswise, nothing but classic functionalities: Knee (soft, medium, hard), Lookahead (off, 1, 2 or 5 ms) which allows to anticipate coming transients therefore protect them as much as possible, then a Threshold, a Ratio (from 1:1 to 1:50) and an Attack/Release envelope. The Monitor button let you hear the gated part of the signal and two extra vumeters display one, the input level, the other the gain reduction. Once again, the displaying of various curves and action of parameters is well implemented and is very helpful for both the settings and to make the plug action easier to understand. On this matter, the .PDF manual which can be opened directly from the interface is extremely complete and didactic. Here are two examples to illustrate the plug efficiency. The first is the BD part already used in the UAD-SPL Transient Designer review (thanks again to Alex Jacquemin who gives us permission to use the live recordings of Outgroove, one of his composition). We only need the attack part, as the original bass drum had no sustain at all. When using a gate on an instrument track, you'll have to reproduce the instrument original envelope. The second example uses the reverberated drum loops of the same review. With appropriate settings of the envelope, lookahead and Ratio/Threshold parameters, you can remove a certain amount of reverb, while keeping musicality, even if you lose some ghost notes. This loop can then be tweaked to something completely different, effectwise. Here is another classic, dedicated to the suppression of interferences due to electrical pollution of the audio signal. However, Wave Arts doesn't only offer a "simple" filtering system for 50 or 60Hz and their harmonics, but also include a buzz suppressor (from bad ground to the motor of a camera) and two brickwall filters (Hi and Low, up to 90dB of reduction...), thus giving the plug-in pass-band filtering ability. The plug-in also offers spectrum analysis, which has a amazing precision in low frequencies (in comparison with Elemental Audio IXL which is yet very accurate). The display refreshing is quite slow, due to the choice of a long time analysis window (without further precision on its type), which allows in most cases to have a good vision of the frequencies you want to eliminate. Too bad there's no freeze function of the waveform, it could sometimes be helpful. On the other hand, you can switch between Pre and Post mode. The Hum module allows you to select the frequency (in Hz), the number of its harmonics (up to 10, fundamental included) and the width of the notch filters (in hundredth of octave). Let's take our first example again, and remove the Hum at 50Hz, Hum which can clearly be seen on the display. To define three harmonics seems to be the correct setting. Last plug-in, MR Noise uses the classic noise print process, in order to substract background noise from useful signal. Settings are familiar: Amount (of reduction), Threshold, Attack and Release. A Knee parameter (Soft, Medium, Hard) allows to apply less or more reduction, according to the useful signal proximity with noise floor. The Auto mode uses the envelope set by the user, while adapting this envelope to the detected transients, in order to preserve their integrity. In comparison with its competitors, MR Noise has a very low latency (13.3ms at 48kHz) and contains other pearls: thus, to have a usable noise print, the plug-in only needs a 50ms section of noise (minimum 100ms for the TC Electronic plug-in, for example). Moe unusual, you can edit the curves graphically (Amount, Thresh, Attack, Noise Floor and Release), even independently on L and R channel of a stereo signal (Noise Floor curve only). Here is another example, a voice, really convincing. One of the big advantages of MR Noise is that it doesn't need long noise sections to take noise prints. Thus you can easily find short noise sections in movie dialogues, live recordings, etc. Even if you drive it into a corner (while looking for a usable result, naturally) the plug-in doesn't produce these characteristic noises (like droplets or squeaks), only the standard comb filter effect. RX was a very good surprise, and is currently the application I use each time I have to clean or restore audio, as I've scrapped any other plug. Hence it seems that any suite in about the same price range would hardly be interesting (RX is $349, MR Suite $499,95). Though the Master Restoration Suite has numerous assets: first a simple and ergonomic interface, each module is easily identifiable and offers just the right amount of parameters. Too much complexity can sometimes put some users off. Then, the CPU consumption is really low, which is quite surprising for this category of plug-in. But if you've ever tried or worked with Wave Arts plugs, you won't be that surprised, because they benefit from one of the best ratio between quality and optimization. For example, a 24bit/48kHz stereo file played in Peak 5.2.1 shows around 13% of CPU drain. If you open the four plug-ins with complex presets, the CPU monitor reaches around 30%, which is an exploit. MR Noise, MR Gate and MR Hum are amongst the best in their specialty, while being amongst the easier to define and use. MR Click gives good results on relatively damaged files, but shows its limitations when the audio signal is too complex or when the undesirable events are too close from the usable signal. Master Restoration Suite, MR Noise, MR Click, MR Hum and MR Gate are Wave Arts products. The audio examples are only used for review purpose and remain the entire property of their authors and beneficiaries. If you believe that we are using works that infringes your rights, please contact us and we'll remove them immediately.